Everyone thinks they know about citrus. After all, we eat on an average at least several servings of citrus every week. But how much do you actually know about the juicy fruit you consume? Citrus has a rich background, some amazing health benefits, and some pretty awesome facts to go right along with it. Let's examine what everyone ought to know about citrus and see what ways we can enjoy it even more. The various species of Citrus are all believed to be native to the subtropical and tropical regions of Asia and the Malay Archipelago, and to have spread from there to other sections of the world. Citrus has been cultivated through the ages, and in some pretty remote places. The history of the spread of citrus reads like a romance novel. Even in very early times, the appearance of both the beautiful tree and fruit attracted the attention of travelers and received mention in their written narratives. However, no matter how loved citrus was, the spread of the citrus tree from one part of the world to another was actually quite slow. Around 310 B.C. the first member of the citrus family was introduced to Europe. For several hundred years this was the only citrus fruit known. A tile floor mosaic found in a Roman villa near Tusculum indicates that lemons and limes were becoming known in Italy. Another mosaic in Rome, this one designed about 330 A.D. for Constantine the Great, indicates that, at least in Italy, oranges and lemons were being grown. It is now known that the sweet orange had been grown for many centuries in China and had apparently reached an advanced stage of cultivation before it became well known to Europeans. Han Yen-chih, wrote in 1178 A.D. and translated into English in the Monograph on the Oranges of Wên-chou, Chekiang, 1923, named and described some twenty-seven varieties of sweet, sour, and mandarin oranges. He also described citrons, kumquats, and the trifoliate orange and discussed nursery methods, grove management, and diseases. Of course, other areas with temperate climates started cultivating citrus as well. Areas such as Spain and other tropical regions did their part to bring citrus to many lands, including the Americas. Through exploration and conquest, sweet juicy citrus found its way around the world. Citrus fruits have long been valued as part of a nutritious and tasty diet. The flavors provided by citrus are among the most preferred in the world, and it is increasingly evident that citrus not only tastes good, but is also good for you. It's well established that citrus and citrus products are a rich source of vitamins, minerals, and dietary fiber that are essential for normal growth and development and overall nutritional well-being. However, it is now beginning to be appreciated that these and other biologically active, non-nutrient compounds found in citrus and other plants (phytochemicals) can also help to reduce the risk of many chronic diseases. Citrus is most commonly thought of as a good source of vitamin C.
However, like most whole foods, citrus fruits also contain an impressive list of other essential nutrients, including both glycemic and non-glycemic carbohydrate, potassium, folate, calcium, thiamin, niacin, vitamin B6, phosphorus, magnesium, copper, riboflavin, pantothenic acid and a variety of phytochemicals. In addition, citrus contains no fat or sodium, and, being a plant food, no cholesterol. Moro oranges are also called blood oranges because of their deep red colored flesh. But don't worry, it isn't real blood - they're really a sweet treat. After chocolate and vanilla, orange is the world's favorite flavor. There are hundreds of ways to eat citrus. 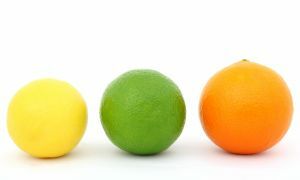 One of the most popular and easiest ways to enjoy citrus is to peel the fruit and separate it into individual segments. Or you can just cut through the peeling and slice it into wedges and peel the juicy section out. You can also juice your citrus for a fun and tasty drink. Both the juice of citrus and the zest is used in cooking to create flavorful dishes. Also, using whole segments of citrus in salads, or even grilled, adds a bright flavor to many meals. Citrus makes a wonderful marinade for fish, meat, and poultry, actually breaking down the fibers and tenderizing it, along with flavoring the dish. With so many ways to eat citrus fruits, there is almost no way you can go wrong, or get tired of it. Learn more about citrus by trying new varieties and using it in new ways. That glass of orange juice you enjoy in the morning is just the beginning! Brand new Easy Citrus Recipes Cookbook for the Summer! Just published instant download in both eBook & kindle versions!